Recently, I was fortunate enough to team up with AirAsia in a travel blogging trip to South East Asia – more specifically, exploring parts of Kuala Lumpur (Malaysia) and Jakarta (Java). I hadn’t planned to return to South East Asia in the near future as I had a multitude of trips already completed throughout 2016, in what has been the most exciting and busy period of my life to date. After returning from Thailand and Singapore a few years earlier and becoming violently ill on the trip home, I hadn’t really thought of travelling back for at least a few more years. I didn’t think the trauma of that particular trip would ever subside, so when this opportunity arose, I bit the bullet and decided it was time to travel back. Never had I expected 2016 to unfold the way it had – such a diverse range of travelling opportunities had presented themselves to me in the first three months alone that it was hard to believe the rest of the year would follow suit in the fashion that it had. Feeling unbelievably lucky and proud of the efforts and time I had invested into what I now consider to be my other job was very rewarding. What I thought would be a mellow and somewhat slower end to the year in regards to travel and destination marketing would soon prove me very wrong as I was fortunate enough to be granted yet another opportunity to explore South East Asia with the worlds best low cost carrier – AirAsia. 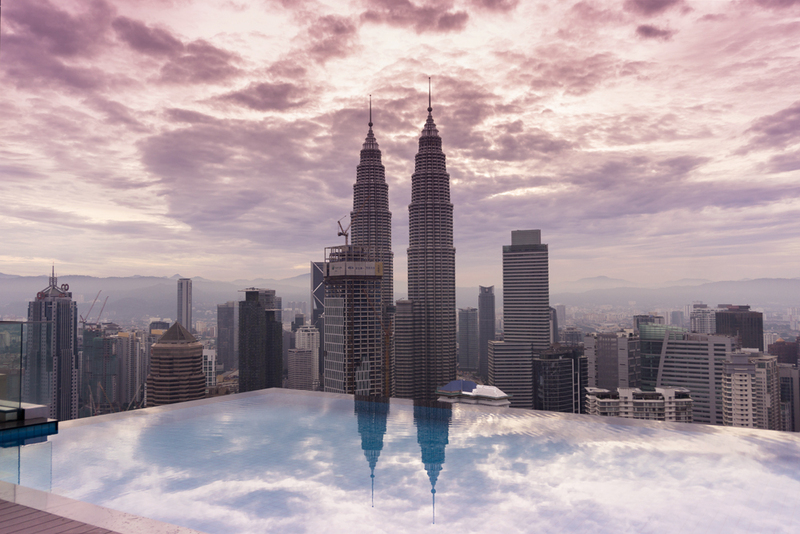 Feeling slightly nervous, yet very excited, it was time to jet off on another adventure to discover the best accommodation, natural attractions and adventure activities that both Kuala Lumpur and Jakarta had to offer. The whole trip was made possible with thanks to the team at AirAsia – to see their range of international flights and accommodation options available, visit their website to find out more details. AirAsia operates regular flights departing from the Gold Coast, Australia direct to Kuala Lumpur, Malaysia. The journey is approximately eight and a half hours and was exceptionally simple in terms of check in, departure and arrival. The long haul flight is operated under AirAsia X – a flight offering economy, quiet zone and hot seats, with the additional option to upgrade to premium flex seats. Check in at the Gold Coast was fantastic. Not only did I receive fantastic service from the check in staff, I was also fortunate enough to be upgraded to a quiet zone seat. The team at check in were more than helpful and happy to answer any queries I had in regards to luggage and departure. It’s important to keep in mind, when travelling with any low cost carrier, that there’s a reason these airlines can offer you the cheapest deals going around. Most of the extra work that other regular airlines may carry out for you (at an inflated rate) isn’t necessarily available when you fly with a low cost carrier – for example, the provision of meals and check in options. My biggest tip when flying with a low cost carrier is to be prepared and to use some common sense. Arrive at least three hours early to an international departure to ensure check in is smooth and you don’t get caught at the back of the line panicking that you’ll never make it through customs and immigration. To save yourself a little bit of time, you can always additionally use the online check in, app or self check in option that’s often made available to you when flying low cost. This is one reason that these particular airlines are able to operate at lower costs. Preparedness is crucial, no matter who you’re flying with. Always check your luggage allowance and weigh your bags a couple of times after packing them. The key to avoid additional fees with low cost carriers is by adhering to their luggage allowances, T&C’s and using a bit of common sense. I’ve seen countless times, how irritable passengers can become because of their own lack of preparation or carelessness to read the T&C’s carefully. Travelling is my passion, as it is for so many others. Don’t let your own lack in vigilance ruin what would otherwise be an enjoyable time abroad. As I was prepared as I could possibly be for all of my AirAsia flights, the entire process from check in, in flight experience, arrival and subsequent departures ran smoothly and efficiently. I would recommend booking all your meals online at the time of ticket purchase with AirAsia. 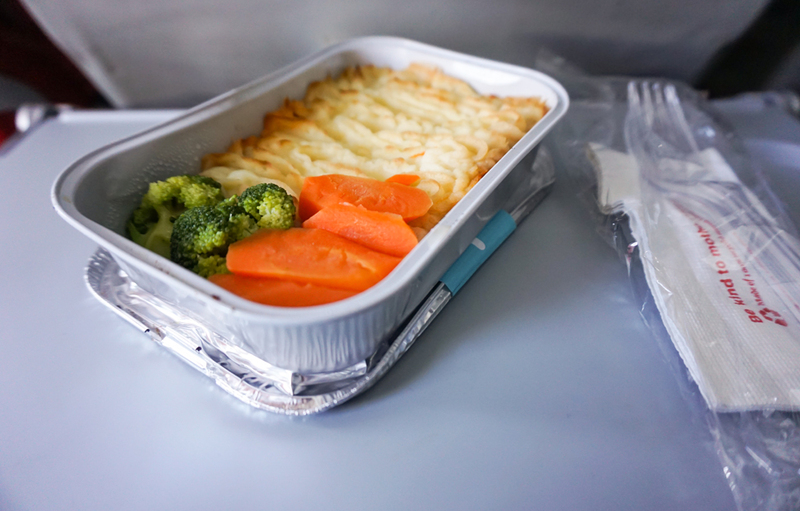 This will ensure you receive your meals first whilst on board, and are often cheaper as you can combine your meal and drink options as a bundled package. 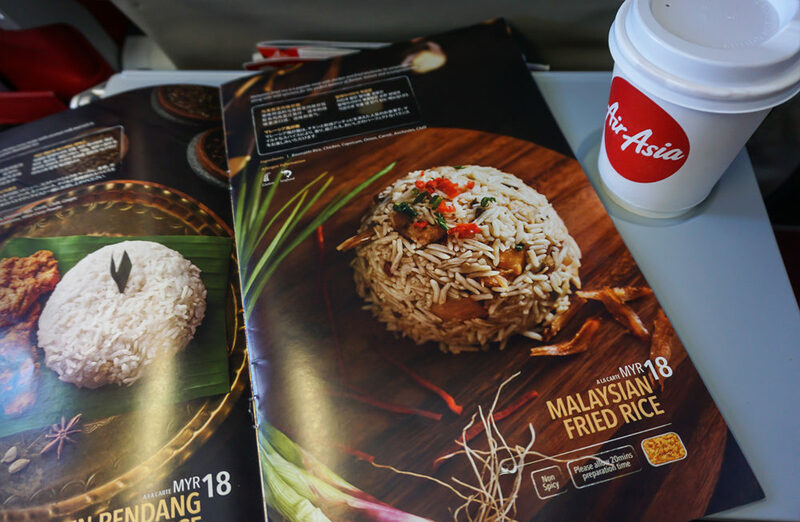 AirAsia offers a comprehensive, Asian inspired menu on-board, as well as online whilst booking. If anything on the Asian inspired menu isn’t to your liking, there are plenty of other options available to suit your taste. There’s a range of main meal options to choose from, coupled with a variety of drinks and snacks. 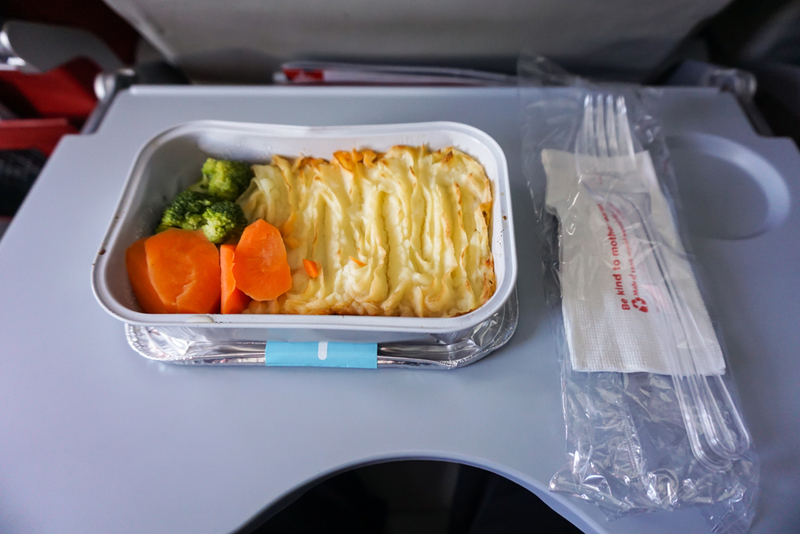 I’d recommend purchasing a couple of meals for an eight-hour flight to get you through. If eating pre-packaged meals isn’t your thing, than once again, use a little common sense and purchase your own before boarding. Alternatively, bring some snacks with you in your carry on luggage. Just be sure to declare anything you don’t finish if you insist on bringing it into the country with you. I purchased the chicken pie with vegetables, a coffee and a chicken pastry on route to Kuala Lumpur. I elected to try the chicken rice as a main meal on the flight home, with additional snacks and drinks to keep me going. Travelling can be tiring, there’s no doubt about it. 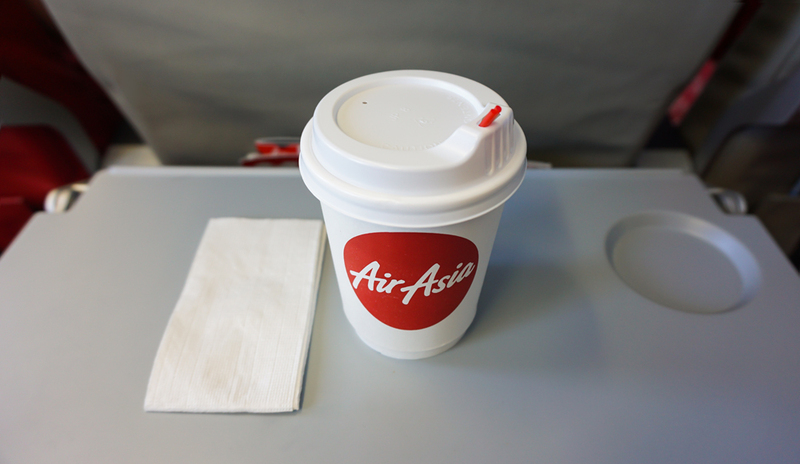 So if you’re a coffee drinker like myself, enjoy a coffee on board your AirAsia flight. I purchased at least one coffee on each flight throughout South East Asia, and if I’m being completely honest, it was hands down, the best ‘airplane’ coffee I’ve ever had. Congrats to you AirAsia on your coffee. It has my tick of approval. The cabin crew on-board were friendly and exceptionally helpful. They were there at every beck and call throughout the entire duration of the flight to assist as best they could where required. I was lucky enough to be seated next to two other empty seats on route to Kuala Lumpur, allowing me to stretch out and get comfortable. The quiet zone of the plane is childfree, so it’s definitely worth upgrading for a little bit of peace and quiet or peace of mind. Other upgrade options include hot seats and premium flex seats. If you’re interested in flying with a low cost carrier, yet wouldn’t mind the freedom of a little extra legroom, why not look into booking a hot seat. Additional costs and extras are all listed on the AirAsia website. All in all, the flight from Gold Coast to Kuala Lumpur was fantastic. No hiccups experienced made for a seamless and easy flight. From check-in to arrival, the staff were fantastic, knowledgeable and willing to assist with all my enquiries. AirAsia offer convenient transfer services at most terminals for international-to-international passengers. Avoid checking in again by proceeding to the transfer desk upon arrival. Keep in mind that whilst flying on shorter flights internally within South East Asia, that these cities and terminals are extremely busy and often over populated; The result, full flights. As mentioned earlier, ensure you are prepared. I found Jakarta airport to be a little difficult to navigate through and find my gate for departure. Arriving earlier allowed me to ask around and get there in time with limited hassles. If I can offer one final tip, travel insurance is a must whilst travelling abroad. If you’re a particularly nervous traveller, or find it hard to make the commitment to explore abroad due to concerns and worries, find a travel insurance company who covers everything for your own peace of mind. Read the terms and conditions carefully to ensure it best meets your particular needs. Never travel without it. First time travellers, rest assured, that by taking out a comprehensive insurance for your travels you are covering yourself for any unexpected mishaps that may occur. I hope this recap of my in-flight experience with AirAsia helps you make a more informed travel choice while researching your next adventure. Below is a detailed YouTube video with a recount of the full experience from Gold Coast to Kuala Lumpur and beyond on-board AirAsia. Please feel free to comment below with any further questions or additional advice. Happy and safe travels.